So, there you have it. 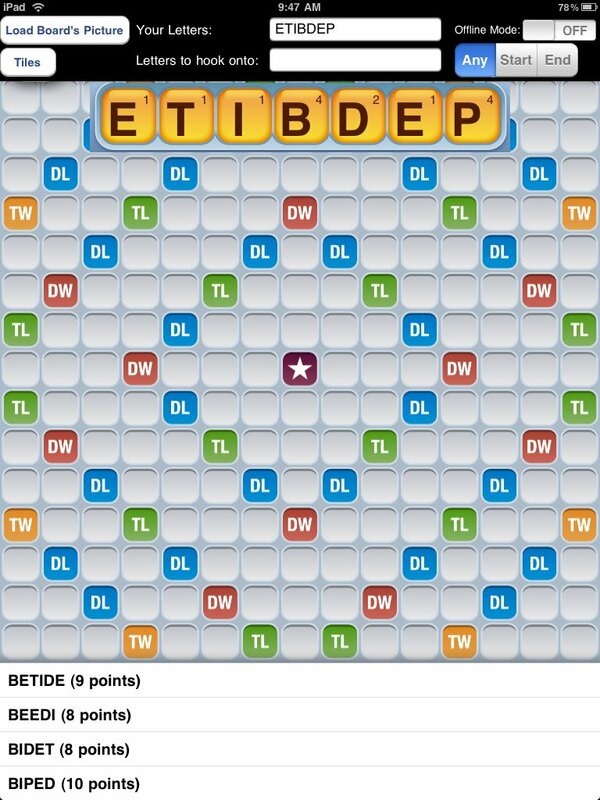 The complete idiot’s guide to Words with Friends. If you want to boost your ego by playing quite possibly the worst Words with Friends player in the history of the world, I’m Katdish10. Oh how I miss this game. 🙂 I was dying when you wrote that you were using the DW & TW tiles as letters! Haha! Hilarious. Maybe you’re just too smart for that game. Um, yeah…too smart. That’s the ticket. yep, I rolled my eyes. No offense. When I got my iPod Touch, a friend recommended the game to me. So I downloaded it, then proceeded to play a game. With myself. A month later, a friend pointed out that it was meant to be played with other people. I asked him “how the heck was I supposed to know that?” He pointed out that the name of the game is Words. With. Friends. BTW, I am amazed that you had never played Scrabble before. I grew up on that game, and my 9-yr-old plays against me all the time now. You’re a riot. I can’t believe you’ve never played Scrabble before. Is that a regular WWF screen? Why did it give you word choice options? Oh, I dunno. Just did a google image search for “new words with friends screen” and this is what came up. We played Monopoly and Life growing up. Never Scrabble. lol. I got really hooked on it about 6 months ago. I was playing too many games all the time. And @peterpollock and @learell were destroying me. I had to delete the app. Hands down, my favorite post of the day. Maybe even the week! Glad you figured it out. Now, the fun begins. Enjoy! You lost me shortly after “after” in paragraph one, line one. SNORT! (6 pts, unless you hit that TW which makes it 18). My personal favorite word of yours was “IS.” As creative as you are, just throw letters up there. Chances are pretty good it will actually be a word. Not a word you can use in a sentence, but a word nonetheless. I’m still crying fowl on “Dharma”. Pffft! Like the show “Dharma and Greg”? Real word. Hi Kathy! I just started playing this past July. I was a little unsure about it at first but I love the game now and can’t seem to put it down. One of my earliest strategies was to just place tiles on the board until it would accept my play! Thankfully I’m a little better now. 🙂 I’ve used a few different resources to improve my playing including studying from other players, looking up word lists and an app called Cheats & Words. Bwahahahahahahahahaha!!! If it makes you feel any better, you’re the only one I’ve been able to beat! WriterMama88 loves you! Yes, Amy. That makes me feel so much better. Thanks. I’m glad to finally know what all the hub-bub is about. Everyone on FB is playing. Now I know to avoid it. I’m pretty sure I would be addicted immediately. Thanks for the giggles this morning! Like others — imagine not having grown up on SCRABBLE? Amazing! If you want an addictive iPhone/iTouch/iPad game, try Cut the Rope. If you get into it, you will hate me for suggesting it. Already have it. I actually like to lose because I love the look on that frog’s face when he loses the candy. I never played the adult version of Scrabble, just Junior Scrabble as a child. I don’t have an iphone, so I wouldn’t know how to play WWF either. As a matter of fact, the first time you tweeted those letters, I thought it was a typo and that the middle W was supposed to be a T. Of course, the F stood for “French Toast”. I mean, the post was funny too, but playing you was hilarious! I left you TW spots all over the board and you avoided them like the plague. Thanks for all your help, Ricky/Arthur/Bobby! Hey, you should be a Nascar driver! I cuurently have 3 games going! Like you, I never was a Scrabble player, and it a little ‘trial and error’ for me to realize making big, impressive words is NOT the object of the game. Scoring points with the TL, TW and etc. is the name of the game. Isn’t technology wonderful. Sorry to hear you’re a Star-bellied Sneetch though(iPhone/Droid reference). What’s sad is when I first got it, I was playing 5 or 6 people at a time and actually stressing out about it. I felt like I needed to play as soon as it dinged that it was my turn. After a couple days I realized I was being stupid and it’s supposed to be at my leisure. Yeah, I’m all kinds of messed up (part of it from being the oldest child, but whatever). Thanks Kat. Great post. This was the best humor piece I’ve read this week. Hope you’re having fun now. You really have gotten better! Glad you’re still playing. I love scrabble, but I think this game would be beyond me! I take was hilarious! Enjoyed your Post! i just pray that i get this soon. mind u i actually went thru medical school yet this has me beyond baffled…maybe just a word of prayer…! You should play against my friend CandySteele. She’s a nurse and plays lots of disgusting medical terms. Once I have placed my letters, how do they begin the gameplay? So what are the letters TL, DL, DW, etc?? Triple Letter, Double Letter, Triple Word, etc. How do I get the count option on words with friends free?